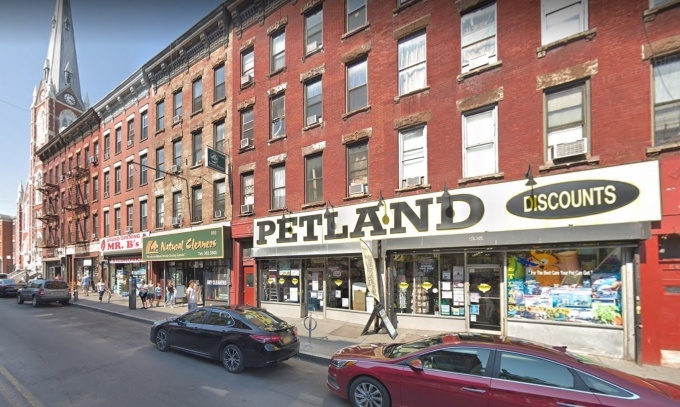 Petland Discounts will be shutting down operations across New York stores, including a handful of locations in Brooklyn, according to state filings. The company will be closing 70 locations in the five boroughs, Nassau and Westchester, and is laying off the 367 employees that staffed the sites in coming months, according to a Jan. 18 filing with the state Department of Labor. Of the 70 locations, 17 are in Brooklyn, including the Petland Discounts on Manhattan Avenue. Petland Discounts Inc. anticipates closing all of the listed stores by April 18, with all employees to be laid off by then. It is unclear if the affected locations represent all the stores in the state. Reports add that the company, founded in 1965, is also closing stores in New Jersey and Connecticut based on filings with respective states’ labor departments. It is unclear why the retail pet store chain is closing, although the company indicated financial reasons in its state filing. The closures come two weeks after Neil Padron, the Queens-based founder of the chain, died of bladder cancer on Jan. 14. He was 74. Amy Eisenberg, his daughter, indicated that the family is still working out what to do in light of his death. Petland Discounts always make me cringe whenever I passed one because I know what goes on in the backs of those places. It amazes me how people feel so sorry for anyone running this pathetic Pet Shop. It was a Petland Discounts in New Jersey that I visited and when I used their toilet which was on a cold winter day they had a cage of ftightened finches on the floor right next to the toilet (?) I tried to get help for these birds but I met opposition at every turn they are very secretive I even got some kind of prank call about animals needing help and mocking me because I couldn’t help them. They engaged in price gouging birdseed in New York City. sometimes their employees were very nice but on the whole they knew nothing about birds .they kept the lights on all night for the birds which makes them go into excessive egg-laying and stresses them out. Are betta fish really sitting in the cold by the front door filthy water they could give a flying f*** about these poor creatures because they’re only worth a few dollars each . I went into a Petland Discounts once on the upper west side nyc, and at the register was a weird tank containing a chameleon that was the color of white marble; he was almost dead because they forgot to put his heat lamp on . & nobody noticed this but me… okay that’s just a few times that I went into those stores if I went in there every other day I’d probably be seeing what they really do. so good-‘ close the doors I hope all the animals get good placements and inept people stop making money off of the misery of animals because you’re only selling these animals to people who know nothing about them and it’s only about profit profit profit profit oh, let’s not forget greed. Good riddance. I hope that they really change their minds. I love that store. Been going there for years. They carry treats that no one else does for my dog who loves them.